Kittery Point Yacht Yard and DiMillos Yacht Sales sponsor world-acclaimed author for double-header of presentations on sailboat cruising and boat electrical systems. KITTERY, Maine – Cruising on a sailboat or powerboat is a dream for many. World-renowned author Nigel Calder has made it his life. Calder, author of a new book Shakedown Cruise: Lessons and Adventures from a Cruising Veteran as well as the best-selling Boatowner’s Mechanical and Electrical Manual, will be offering two presentations on Saturday, Feb. 2 at the Kittery Community Center in Kittery. Hosted by the Blue Water Sailing Club, the presentations are sponsored by the Kittery Point Yacht Yard and DiMillos Yacht Sales. At 9 a.m., Calder will talk about his early cruising adventures in the Caribbean and the lessons he and his wife learned, including voyaging with small children aboard. Both presentations will be held at the Kittery Community Center, 120 Rogers Road, Kittery (just east of the Kittery Traffic Circle off I-95 Exits 2 (southbound) and 3 (northbound). To register for either of the Feb. 2 sessions by Nigel Calder, visit the Blue Water Sailing Club website at https://bluewatersc.clubexpress.com. For more information or questions, contact Jack Savage at jacksavage@roadrunner.com. We know Nigel Calder as the boat systems guru who explains how to bleed our diesels, balance our electrical systems, and understand vector charts. This knowledge was hard earned. 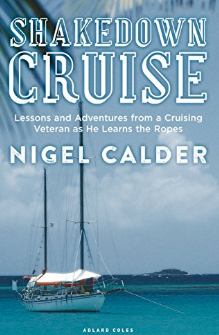 Based on his most recent book, Shakedown Cruise, Calder will describe his early years of cruising including getting run down by a freighter in the North Sea, finishing off a bare hull, and setting off for a round-the-world cruise with his wife Terrie, five months pregnant, and their one-year-old child. Come to be entertained and educated, and learn how, in spite of numerous groundings and other minor catastrophes, Calder has persuaded a reluctant sailing partner, who would rather travel in an RV, to adventure with him at sea for more than forty years. This presentation made possible in part thanks to the generous sponsorship by the Kittery Point Yacht Yard, in Kittery Maine: Fine Work, Fine Boats Since 1963, DiMillos Yacht Sales. The number one source of problems on boats large enough to have an electrical system, both power and sail, lies in these electrical systems. Tech guru Nigel Calder, author of the best-selling ‘Boatowner’s Mechanical and Electrical Manual’ (now in its 4th edition, with over 300,000 copies sold) takes participants through the core design and installation requirements necessary to head off electrical systems problems. Nigel rarely has electrical problems on his boats. If you follow his prescriptions, you too will have trouble-free systems. No previous experience is required. This presentation made possible in part thanks to the generous sponsorship by the Kittery Point Yacht Yard in Kittery, Maine. Fine Work, Fine Boats Since 1963, and DiMillos Yacht Sales. Nigel Calder is widely acknowledged as the world’s foremost writer on boat systems maintenance. A diesel mechanic for more than 25 years, he has also been a boatbuilder, cabinetmaker, and machinest. His book Boatowners’ Mechanical and Electrical Manual: How to Maintain, Repair, and Improve Your Boat’s Essential Systems is a veritable bible for boat owners. Calder is also the author of How to Read a Nautical Chart, Nigel Calder’s Cruising Handbook, Refrigeration for Pleasureboats, and Marine Diesel Engines. When not cruising on his sailboat, Calder lives in midcoast Maine. Since 1998, DiMillo’s has been servicing the boating community and providing exceptional service to our customers. With over 200 years of combined brokerage expertise, you can expect your experience to be anything short of excellent. We provide a full time, year round service team that focuses efforts on new boat buyers and brokerage buyers. The service team’s capabilities include all aspects of commissioning new vessels, yacht repair and in-house captain services. DiMillos Yacht Sales has officially opened an office at KPYY’s Kittery facility. The in-house brokerage representative is Tim Kennedy, who can be reached at tim@dimillos.com or (207) 632-0557. The Blue Water Sailing Club offers year-round fellowship in the pursuit of safe boating, cruising, and racing among sailors. Our members sail and live in the Northeast as well as Chesapeake Bay and Florida. Instead of a permanent clubhouse or dock, Blue Water offers a wealth of educational and social opportunities on water and on land. Volunteerism is the lifeblood of Blue Water, and our more than 300 members organize our events. Each summer, we plan club-sponsored cruises along the Maine coast, the Maritimes, Long Island Sound, Buzzards Bay, or other destinations.